Problem: A 350 GM small block engine had a rebuilt water pump installed. Before installation, the rebuilt water pump was painted to match the color of the engine block. Then the vehicle was driven about 1-2 miles. At this time, the lower radiator hose came off of the water pump inlet tube and all of the engine coolant came out. This happened several times even after new hose clamps were installed and checked for proper tightness. What could be the solution to this problem? 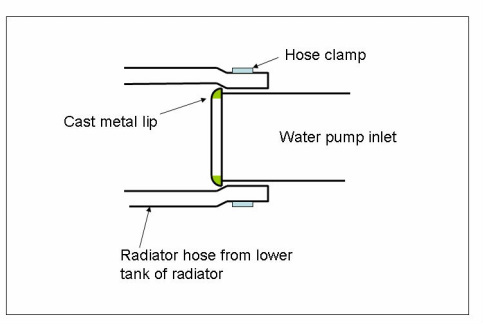 The drawing to the left shows a sectional view of how the lip is used to hold and seal the radiator hose to the water pump inlet tube. As the hose clamp is tightened, the radiator hose is secured to the right of the cast metal lip. This makes it difficult for the hose to slip off. With only a partial lip and the increased pressure in the cooling system, the radiator hose easily slipped off, causing all the coolant to come out. If the water pump housing is painted, make sure the surface where the radiator hose touches the water pump is not painted and has a rough cast iron surface. 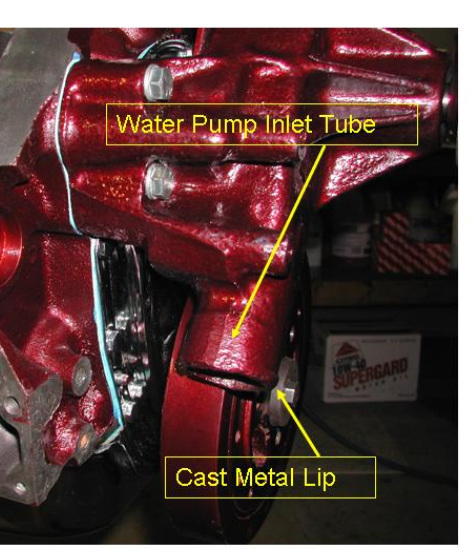 Also, make sure that when a rebuilt water pump is used, it has a full cast metal lip. In some cases, an enhanced cast metal lip may be ground into the casting using a hand grinder. Be careful not to grind too deep into the casting, possibly causing the casting to weaken. If this doesn’t work, you will need to purchase a new water pump that has a full cast metal lip.